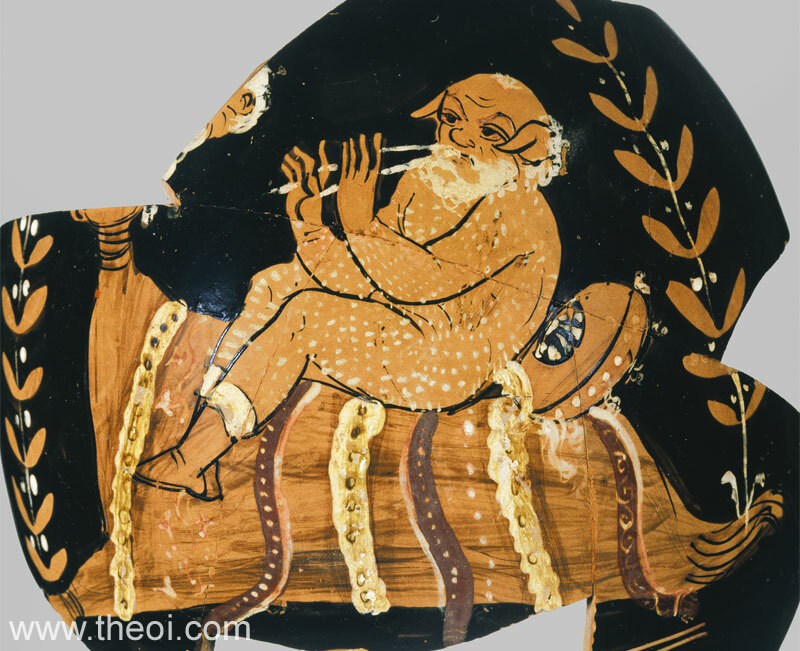 Silenus as a musician. – Image source: http://www.theoi.com/image/T50.1Seilenos.jpg. Vergil, Rome’s most celebrated poet, in his sixth eclogue (an altogether intriguing piece! ), imagines a fantastic story. Silenus lies in a cave, sleeping off his state of inebriation, when two young men, Chromis and Mnasyllos, catch sight of him. Driven by their feeling defrauded of many a song by Silenus, and supported by the Naiad Aegle, they bind Silenus with his own garlands. ille dolum ridens ‘quo uincula nectitis?’ inquit. soluite me, pueri: satis est potuisse uideri. Laughing at the trick, he said: ‘Why entwist those fetters? Release me, boys: it suffices to be perceived as powerful. Satis est potuisse uideri – it suffices to be perceived as powerful: an apt summary of most nations’ foreign policy, to be sure, but also (and more importantly) an important turning point in the eclogue itself. It provides the point at which Silenus finally appears ready to live up to his promises, and to sing, overcome by the ‘appearance of power’ (and his remaining intoxication), his resounding song of cosmogony, the power of love, the Muses and poetic initiation, and mythical sin and suffering. It was this famous passage of power, cosmogony, love, and song (and songs in songs), that I was reminded of, when I went to Italy last week, looking for a number of Latin verse inscriptions for my current research project. AE 1972.39. – Photo (c) PK, 2014. One of the inscriptions that I managed to see on an extended walking tour down the Via Appia, was a marble plaque preserved in the context of the catacombs of S. Sebastiano, affixed to a wall by a door in the gift-shop area of the San Sebastiano complex. [- – -]ti, udis athanatos. … [- – -]t(i)us: no one is immortal. The plaque is broken into (adjoining) pieces, and it has been resected on the left and on the top (possibly at the bottom as well, but this is less certain). As the text (in typical epigraphical self-referentiality) points out, what has been lost on the left-hand side, in addition to the actual words that opened the surviving lines, is an acrostic, spelling out the name of the deceased. It is quite possible (but not necessarily cogent) that the deceased was a male, and that his name ended in -t(i)us, as preserved in the final line, preceding the reminder udis athanatos (a translitteration of the Greek phrase οὐδεῖς άθάνατος): similar texts that have the phrase udis athanatos, show personal names, addressed by the inscription, in front of it, and the surviving letters -ti perfectly well fit the morphological requirements for a vocative in this position. Before mentioning any laments (querellae) and pains (dolores), the inscription specifically refers to ‘birds’ (aues) and ‘garrulous song’ (garrula cantus). Garrula cantus, of course, is a feature that is easily associated with birds themselves (see, for example, CIL VI 34421 and EChrAfr III 176, to mention but two inscriptions). Garrulus, however, is also a word often associated with the behaviour of young children – and one may wonder if this is not a clue that helps to unlock the entire text, in spite of its high level of fragmentation. Does it seem unreasonable to assume that a child – boy or girl – managed to cast his spell over his parents: potuisse uideri, even though he (or she) never managed to grow up and show his (or her) actual power? He (or she) acquired the gift of speech and song, birdlike: [- – – sicut a]ues et garrula cantus. Yet, there was reason for querellae, laments, to be voiced (for the deceased himself/herself, or for someone else?) – and eventually, the child even added dolores, pains: undoubtedly a reference to the child’s untimely demise. Is there anything else one can gauge from the text about the (presumed) child? Well, one more thing, perhaps. Udis athanatos, no one is immortal: why does this phrase appear in translitterated Greek? The manfredclauss.com database currently holds five entries for this phrase: four from Rome (this one as well as CIL VI 10889. 20453. 21617), and one from nearby Ostia (CIL XIV 603). All the four other examples in addition to the present case here show Greek personal names – suggesting that the present example of AE 1972.39 belongs into the sphere of Greek migrants in Rome. Did this young Greek, garrulus (or garrula) and all, too, manage to overpower his/her parents, like Chromis and Mnasyllos did with Silenus in Vergil’s eclogue? But it is a lovely thought. This entry was posted in Carmina Epigraphica and tagged Carmina Latina Epigraphica, Death, Song Culture. Bookmark the permalink.